When an airplane en route from Honolulu to San Francisco starts losing fuel, its passengers and pilots (Robert Stack and John Wayne) prepare for an ocean landing. 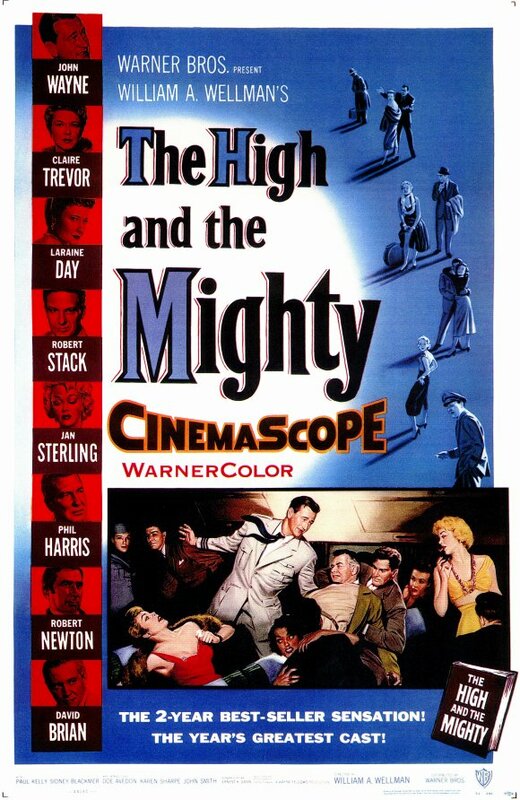 It’s impossible to watch William Wellman’s The High and the Mighty without thinking about the countless times its basic premise has been spoofed — most notably in the Zucker brothers’ comedy classic Airplane! (1980). Indeed, as a “straight” melodrama, The High and the Mighty falls flat, with hopelessly cliched characters, truly laughable dialogue (“How can I ever be afraid when you hold me like this?”), and not nearly enough genuine drama or excitement for a disaster flick. Unavailable for many years, this film developed nearly a cult following (see posts on IMDb), with fans clamoring for its release on DVD; but its appeal will ultimately be limited to either devotees of John Wayne (who, surprisingly, doesn’t dominate the proceedings), or those anxious to see the film which inspired Airplane!. No, but it’s worth a look as perhaps the definitive “airplane disaster” flick. Unless something like, oh, say, the Chinese water torture appeals to you, this is not a must. I tried revisiting it and, 45 min. in, I realized I just couldn’t go any further (not again) with…one of the most boring films ever made!!! Apparently the most popular film of 1954 (how often ‘most popular’ is a bad, bad sign), it boasts a very famous theme song. Small wonder that ‘THATM’ inspired ‘Airplane’ (among the funniest movies ever made). It’s certainly endlessly “spoofable” but, on its own, it’s sheer torture…loooong before anything goes wrong with the plane! I have actually had a more interesting time watching paint dry.